Ephraim Brasher was a noted goldsmith and silversmith who was highly regarded for his skills, and well known for his hallmark, which he stamped on his own coins and the coinage sent to him for assay. In 1787 Brasher made a small number of doubloons and other coins for general circulation. Doubloons because they were the coin of the realm and at the time, America had no established currency standard. There were mints operating in some states but they mostly produced small change copper coins. The Brasher doubloons were about the weight of a Spanish gold doubloon, a common coin in colonial America. Doubloons contained $14 worth of gold, but the Brasher Doubloons contained $15 worth of gold when they were made, and fifteen dollars in 1787 would be the equivalent of around $2,800 in 2011. The most unique specimen was sold in December 2011 by rare coin dealer, Steven L. Contursi. 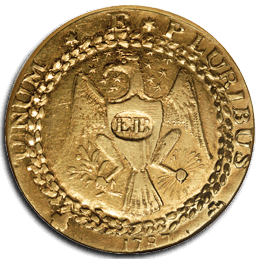 It is unique because it is the only Doubloon with Ephraim Brasher’s initials, ‘EB’, punched across the breast of the eagle depicted on the obverse of the coin The six other surviving coins show the ‘EB’ stamp on the eagles right wing. The eagle depicted on Ephraim Brasher’s design for this famous gold coin is shown clutching arrows in one talon and an olive branch in the other. This image has been used again and again on many United States coins. It is thought to represent the belief that America always wants peaceful relations with its neighbours, but also has the strength and willingness to defend itself when required. Initially the rare Brasher Doubloon was housed in Baltimore for almost 100yrs where it was owned firstly, by the Baltimore & Ohio Railroad magnate T. Harrison Garrett, and later by Johns Hopkins University. This rarest of American coins was also the subject of the 1942 Raymond Chandler novel, “The High Window,” and then the 1947 movie, “The Brasher Doubloon”. In January 2005, Steven L. Contursi purchased the Brasher Doubloon for $3 million and for the next seven years Contursi exhibited the gold doubloon at coin exhibitions across the USA. Another of Ephraim Brasher’s doubloons was sold on January 12, 2005 at Heritage Auction Galleries: being a ‘New York Style EB Punch on Wing’, which sold for $2,415,000. The unique Brasher Doubloon, known as the 1st American Dollar Gold Coin, was then sold by Steven L. Contursi in December 2011. It was bought by Blanchard and Company of New Orleans, who then sold it to an undisclosed Wall Street investment firm for nearly $7.4 million, the most money ever paid for the historic rare coin. The Brasher doubloon falls into the rarefied strata of coin collecting where big-stakes plays are made for classic rarities. Rare coins such as the 1804 silver dollar, the 1861 Confederate half dollar struck in New Orleans and the 1894-S dime struck in San Francisco, all of which command huge prices. Ephraim Brasher was born in 1744 and died in 1797, he was a highly regarded goldsmith who worked out of New York but was of Dutch heritage. He also assayed the quality of many foreign coins used in America in the late 18th century. In 1790, Ephraim Brasher lived at 5 Cherry Street in lower Manhattan, where he was George Washington’s neighbor. 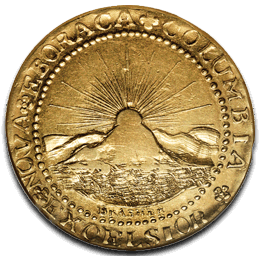 In 1786, Brasher created at least two gold doubloons that copied the style of coins struck in 1742 in Lima, Peru. In 1787, he made at least eight more gold doubloons and a gold half doubloon in which a wholly new style that celebrated both New York State and the new nation of which New York was now a part. In February 1787, Brasher and a colleague petitioned the New York legislature for a contract to strike copper coins, but the state declined their request.